SKU: 347. Category: Hospitals & Nursing Homes. 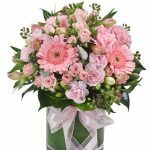 This elegant petite basket of beautiful and fragrant pastel blooms is a wonderful way to send your heartfelt well wishes and thoughtful sentiment.